September 1915 slide in Culebra Cut that blocked canal traffic for almost seven months. In the late afternoon of October 14, 1914, several million cubic feet of rock and mud rumbled down Gold Hill in Culebra Cut, closing the Canal for six days. A year later, on September 18, 1915, a massive slide hit Culebra (pictured), closing the Canal for nearly seven months, the longest closure of the Canal to date. During the course of the Canal’s first century of operation, there were more than 60 slides, with several of the slides temporarily restricting passage through the Canal. The most recent closure happened on September 7, 1986, when a slide along the Cucaracha area of Culebra closed the Canal for 12 hours. In 1915, President Woodrow Wilson asked the National Academy of Sciences to appoint a committee to study the prevention of slides. Further studies during the 1940s and 1950s led to an increased understanding of the geology of Culebra. In 1968, the Canal Commission instituted a Landslide Control Program to provide geotechnical advisors to monitor and stabilize potential slide areas, a task now undertaken by the Panama Canal Authority’s Geotechnical Advisory Board. Centennial Bridge across Culebra Cut. 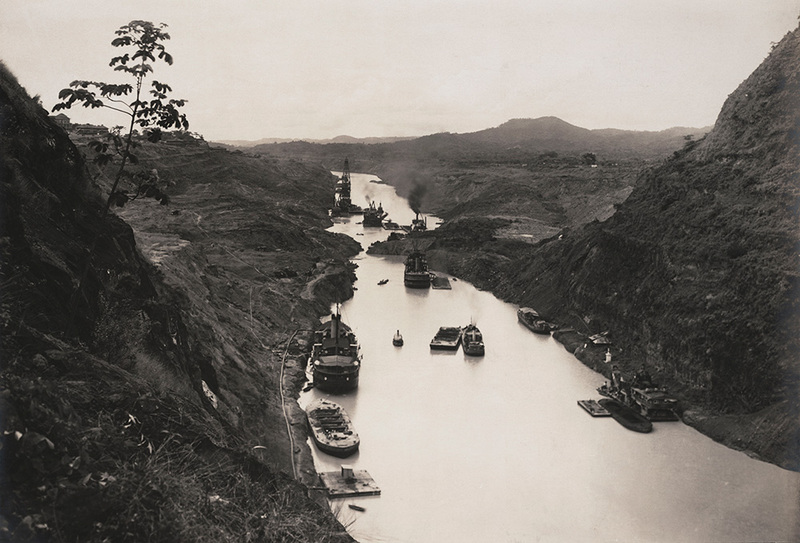 Photograph courtesy of the Panama Canal Authority. To control the Canal’s watershed, U.S. engineers completed work in 1935 on the Madden Dam. Located east of the Canal Zone, the resulting reservoir regulates the flow of the Chagres River into Gatun Lake. In the early 1940s, engineers completed a paved road from Panama City to Colón via the Madden Dam, creating the first highway across Panama. In 1955, the U.S. agreed to increase annual annuity payments to Panama, end the gold-silver pay scales, and construct a bridge across the Canal. 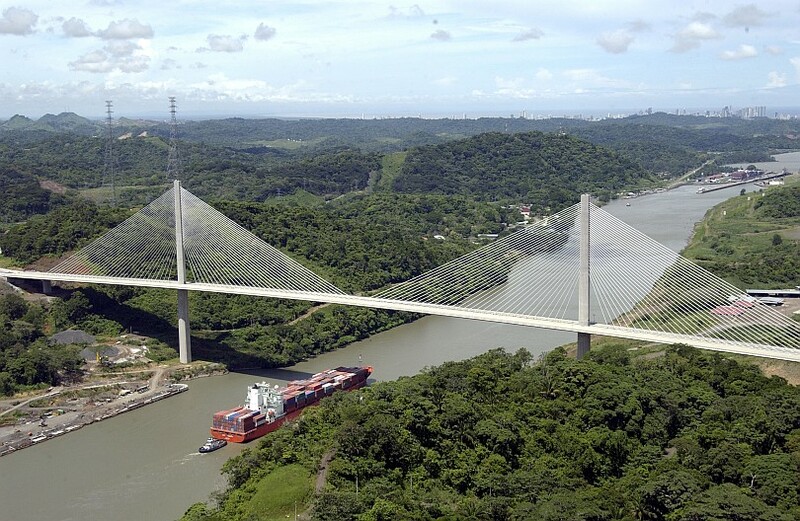 Opened in 1962 at the Pacific entrance, the Bridge of the Americas was the first highway bridge that linked the northern and southern regions of Panama that had been separated by the Canal Zone. In 2005, the Centennial Bridge (pictured) opened across Culebra and a third bridge is being planned at the Atlantic entrance. Culebra Cut’s narrow channel has seen extensive modifications during the past fifty years. In the 1960s, engineers added lighting along the Cut allowing for night transits. Engineers also widened the nine-mile channel from 300 to 500 feet to permit two-way traffic. A second widening project, completed in 2001, increased the Cut’s span to 630 feet along straight stretches and 730 feet in the curves. 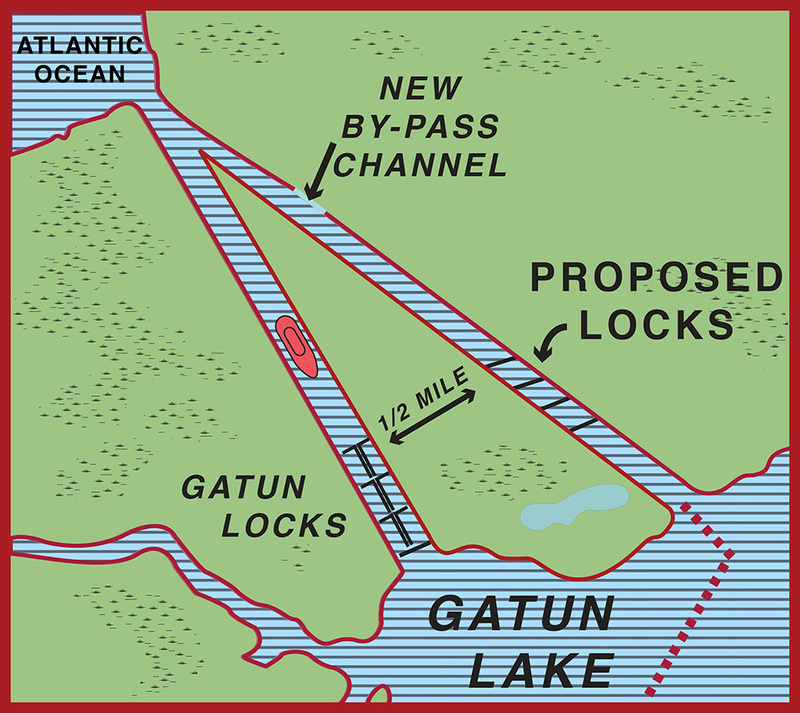 Map of proposed third set of locks planned by the U.S. Army in 1941. On August 15, 1939, the 25th anniversary of the Canal’s opening, the SS Ancon, the first commercial vessel to transit the Canal, reenacted its original journey. The Ancon’s 58-foot beam easily fit within the 110-foot-wide lock chambers. But by the late 1930s, oceangoing ships, especially military vessels, were increasing in size and would soon become too wide for the existing locks. Another growing concern was sabotage to the Canal, since one well-placed explosion could cripple the lock system. As World War II loomed in Europe and Asia, Canal officials recommended building a third set of locks that could handle larger ships and add a measure of protection against a military strike. In 1939, Congress approved a six-year expansion project with a cost estimate of $277 million. The new lock chambers were to be 200 feet longer and 30 feet wider than the existing locks and placed at a safe distance from the locks at Gatun, Miraflores, and Pedro Miguel. Excavation began July 1, 1940, and continued until May 23, 1942, when Secretary of War Henry Stimson terminated the project as funding shifted to other war-related priorities. Nearly 13,000,000 cubic yards of material had been removed from Atlantic and Pacific approach channels, which lay dormant until Panama began construction of a new set of locks in 2007. 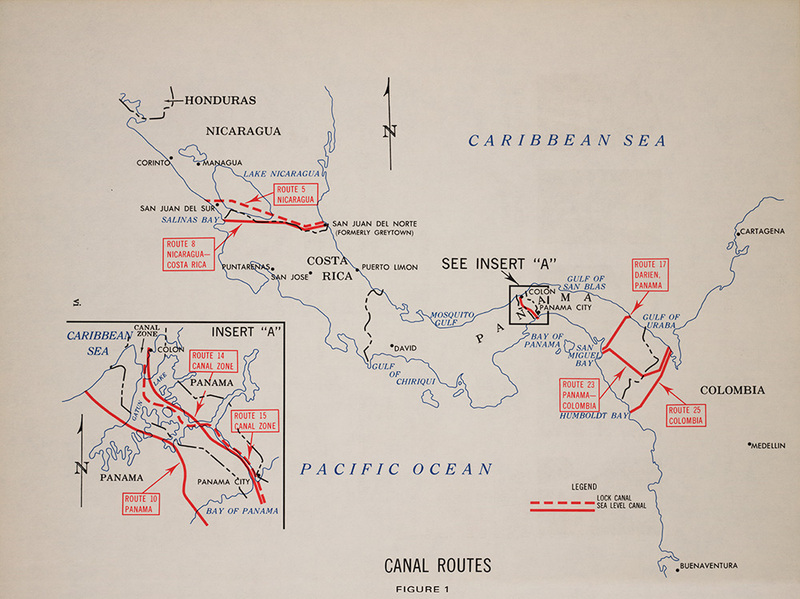 Map of proposed sea-level canal routes, from Interoceanic Canal Studies, 1970: Final Report. Washington, DC, 1971. In the mid-20th century, political relations between Panama and the U.S. became strained over the American presence in the Canal Zone. Presidents Franklin Roosevelt and Dwight Eisenhower renegotiated the original 1903 canal treaty, but U.S. concessions did little to ease ill feelings. Tensions boiled over on January 9, 1964, as Panamanian demonstrators clashed with U.S. military troops. Three days of violence convinced President Lyndon Johnson to negotiate a new canal treaty, although the effort ultimately failed. President Johnson also convened the Atlantic-Pacific Inter-Oceanic Canal Study Commission charged with investigating the feasibility of a sea-level canal, which would have been easier to defend and operate than a locks canal. 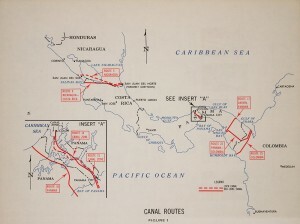 The commission examined eight possible routes across Panama, Nicaragua, and Columbia (pictured). Four of the eight routes (8, 17, 23, and 25) offered the possible use of nuclear excavation as part of the Atomic Energy Commission’s Operation Plowshare. The Canal Commission published its findings in December 1970, recommending Route 10 at an estimated cost of $2.88 billion. Work on the sea-level canal never began. Environmentalists had concerns about cross-contamination of the two oceans and the Vietnam War made the high price tag unreasonable. The Panama Railroad. Photograph courtesy of Kansas City Southern Railway. Following a business boom during World War II, the future of the Panama Railroad was in doubt. By 1955, the railroad was losing money and many canal officials viewed the line as an inefficient mode of transport. In December of that year, Canal Zone Governor John Seybold testified before a congressional subcommittee that it was time to do away with the rail line and replace it with a trans-isthmian highway. Congress balked at the recommendation, though funding for improvements to the railroad were minimal over next two decades. In 1979, the U.S. transferred the railroad to Panama as part of the Carter-Trujillo agreement ending American ownership of the Panama Canal. 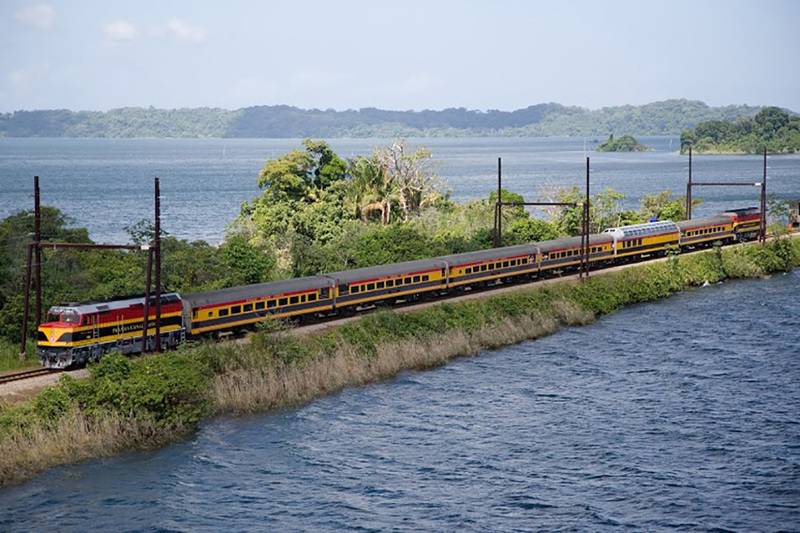 On February 17, 1998, the government of Panama awarded the Panama Canal Railway Company, a joint venture between Kansas City Southern Railway and Mi-Jack Products, a 50-year concession to rebuild and operate the line. With an investment approaching $180 million and with over two million containers transported since the start of operations in November 2000, the revitalized railroad provides passenger service, an efficient intermodal link between the Pacific and Atlantic ports, and complements the existing hub transportation infrastructure provided by the Canal, the Colón Free Trade Zone, the Port terminals, highways, and airports. Size comparison of new locks with 1914 locks. 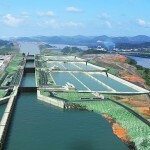 Image courtesy of the Panama Canal Authority. Treaty negotiations between Panama and the U.S. that began in the 1960s continued during the Nixon and Ford administrations. Little progress was made until 1977 when President Jimmy Carter and General Omar Torrijos signed an agreement to hand over the Canal to Panama at the end of the century. Ratified in 1978, the Torrijos-Carter Treaty was actually two treaties. One treaty required the U.S. to relinquish ownership of the Canal to Panama at noon on December 31, 1999. The other gave the U.S. the right to use military force to defend the neutrality of the Canal. 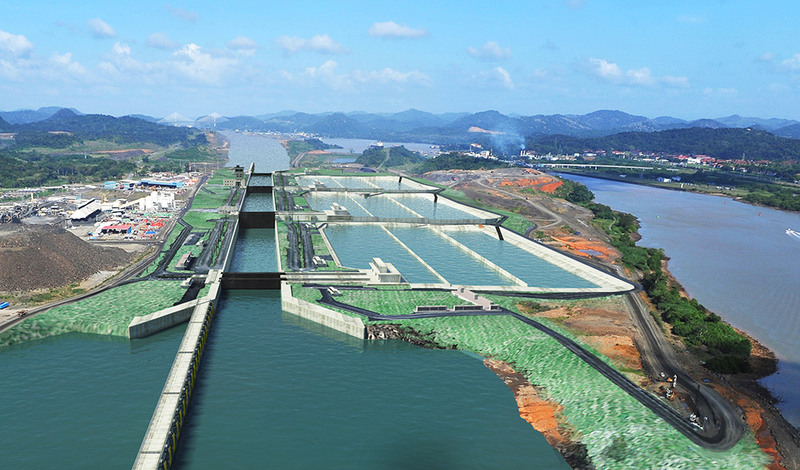 As new owners of the Canal, Panamanians changed the operating model from a public utility to a for-profit enterprise and developed an expansion plan. In 2007, construction began on a $5.2 billion expansion project to build a third set of locks at both the Pacific and Atlantic entrances. 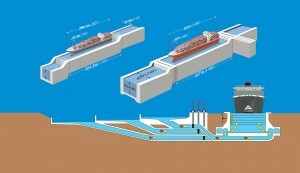 Each lock will have three chambers, water-saving basins, and rolling gates. Lock chambers (pictured) will be 400 feet longer and 70 feet wider than the existing locks. The expansion project also includes raising Gatun Lake’s maximum operating level, dredging the existing navigational channels, upgrading the locomotive “mules” that guide ships through the locks, and launching a new fleet of tugboats. 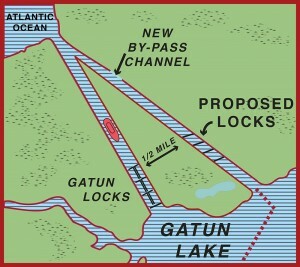 Artist rendering of the new third set of locks. Note the water saving basins to the right of the lock chambers. Image courtesy of the Panama Canal Authority. Oceangoing vessels that fit within the width, length, and depth of the original Panama Canal lock chambers are known as “Panamax” ships. Several larger classes of civilian and military ships have been able to squeeze through the locks with only a few inches to spare. Other ships, such as post-World War II aircraft carriers, were built with dimensions larger than those of the Canal. In 1988, the first commercial “Post-Panamax” ships were launched. Designed intentionally to carry greater payloads, “Post-Panamax” ships were too large to fit through the Canal. 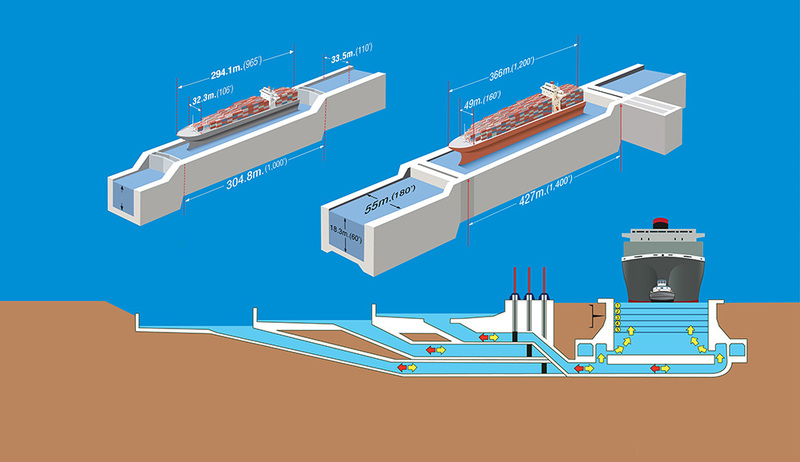 The expanded canal will allow the even larger “New Panamax” ships the ability to transit the Canal. Although the new lock chambers will be much larger than the existing locks, they will use less fresh water to lift ships through the locks. Each chamber will be connected to three water-saving basins (pictured). To lift a ship, water from the basins will fill a chamber using gravity. After a ship passes through a lock, the water is returned to the basins rather than dumping it into the sea. The new system will reduce fresh water use by seven percent, ensuring a sustainable watershed.